Continuous Glucose Monitoring (CGM) technology enables you to monitor your glucose levels 24 hours a day through a sensor that sends the readings to a MiniMed® insulin pump. If used with the MiniMed® 640G you get the intelligence of SmartGuardTM to predict when you are approaching a low glucose level 30 minutes in advance and automatically stop insulin delivery. 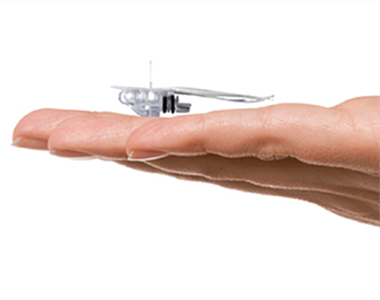 SmartGuardTM will automatically resume insulin delivery when your glucose levels recover1. In essence, CGM provides a more complete picture of your blood glucose levels by giving you early warnings of lows and highs that HbA1C and fingerstick testing alone cannot always identify. In fact, use of CGM has been shown to lower HbA1c levels2 and reduce the time of hypos3 . The pump, when combined with the GuardianTM 2 Link transmitter and the enhanced EnliteTM glucose sensor, wirelessly transmits readings to your MiniMed® 640G. The readings are updated every five minutes and appear on the screen in colour. These regular updates can give you a clear understanding of how your glucose levels are tracking. The glucose sensor only needs to be changed every six days. WHAT ARE THE COMPONENTS OF CONTINUOUS GLUCOSE MONITORING? 1. GuardianTM 2 Link Transmitter connects to the glucose sensor and sends glucose readings to your insulin pump. 2. The EnliteTM Glucose sensor measures glucose levels in the body. 3. 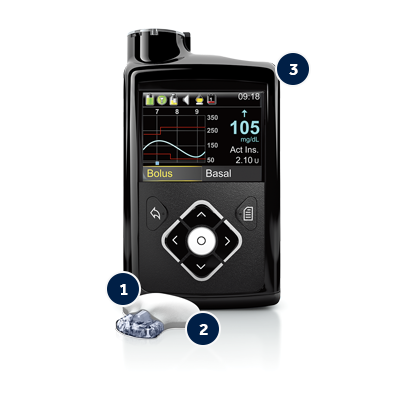 The MiniMed® 640G insulin pump displays glucose readings. Research shows that 85% of patients experienced no pain upon EnliteTM Sensor insertion7. INTERESTED IN A NEW WAYTO MANAGE YOUR DIABETES? 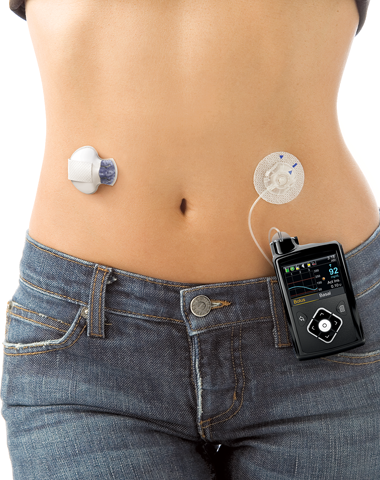 HOW CAN CONTINUOUS GLUCOSE MONITORING BENEFIT ME? 60% of glucose lows may not be revealed with fingersticks alone2. CGM identifies four times as many serious glucose incidents as self-monitoring of blood glucose (SMBG)2. Parents who can relax and no longer feel that they have to check on their child through the night. Sports enthusiasts and students who can concentrate on competing or taking their exams without worrying. Busy workers who can get on with their day-to-day activities with less anxiety. Women who are pregnant or are thinking about becoming pregnant. The dynamic resume feature is based on certain preset criteria: sensor glucose must be 1.1 mmol/l above the preset low limit and predicted to be 2.2mmol/l above within 30 minutes AND insulin must have been suspended for at least 30 minutes. User Evaluations. Data on File, Medtronic MiniMed, Inc., Northridge, CA. Frier, BM. The economic costs of hypoglycaemia. Br J Diabetes Vasc Dis. 2011;11:10–12.